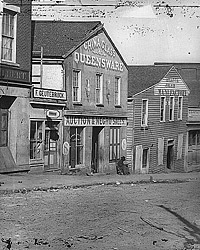 Lincoln chronicler Paul Findley wrote: “In the middle of the public square in Lexington stood a slave auction block. 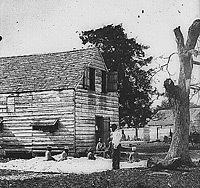 Nearby, a public whipping post reminded the slaves of the punishment they would receive if they overstepped boundaries — if they failed to ‘stay in their place.’ News articles in the Lexington papers revealed the deep but submerged hostility between slave and owner. A young slave girl named Cassily, for example, had been indicted for mixing an ounce of ground glass with the gravy for dinner and serving it to her master. A few days after Lincoln arrived in Lexington, the death of Mrs. Elizabeth Warren received widespread publicity. Most of the town thought she had been murdered by slaves. 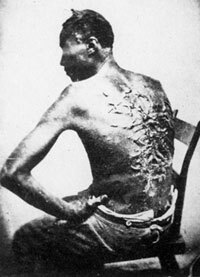 Reports of similar incidents in other towns appeared frequently in the newspapers Lincoln read during his Lexington vacation.”23 This sojourn was Mr. Lincoln’s first extensive experience with slavery. Ida M. Tarbell, The Life of Abraham Lincoln, Volume I, p. 220. Louis A. Warren, Lincoln’s Youth, Indiana Years, p. 13. Richard Nelson Current, Speaking of Abraham Lincoln, p. 162. Lowell H. Harrison, Lincoln of Kentucky, p. 81. Ida M. Tarbell, The Life of Abraham Lincoln, Volume I, p. 220-221. Allen C. Guelzo, Abraham Lincoln: Redeemer President, p. 121. Roy P. Basler, editor, The Collected Works of Abraham Lincoln, Volume IV, p. 60-67. Louis A. Warren, Lincoln’s Youth, Indiana Years, p. 184. 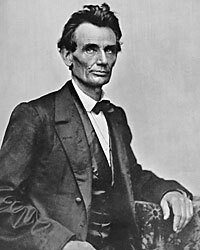 Douglas L. Wilson and Rodney O. Davis, editor, Herndon’s Informants: Letters, Interviews and Statements about Abraham Lincoln, p. 457 (William H. Herndon interview with John Hanks, ca. 1865-1866. Hanks’ account may be questioned since Mr. Lincoln said Hanks traveled only as far as St. Louis.). William H. Herndon and Jesse W. Weik, Herndon’s Life of Abraham Lincoln, p. 63. William H. Herndon and Jesse W. Weik, Herndon’s Life of Abraham Lincoln, p. 63-64. Richard Nelson Current, Speaking of Abraham Lincoln: The Man and His Meaning for Our Times, p. 19. Kenneth J. Winkle, The Young Eagle: The Rise of Abraham Lincoln, p. 251. Daniel Green Burner, “Lincoln and The Burners at New Salem”, The Many Faces of Lincoln, p. 191. Kenneth J. Winkle, The Young Eagle: The Rise of Abraham Lincoln, p. 252. Don E. and Virginia E. Fehrenbacher, editor, Recollected Words of Abraham Lincoln, p. 383 (John E. Roll, Chicago Times-Herald, August 25, 1895). Michael Burlingame, The Inner World of Abraham Lincoln, p. 37. Michael Burlingame, The Inner World of Abraham Lincoln, p. 35. Allen C. Guelzo, Abraham Lincoln: Redeemer President, p. 125. Kenneth J. Winkle, The Young Eagle: The Rise of Abraham Lincoln, p. 266. Lowell H. Harrison, Lincoln of Kentucky, p. 82. Katherine Helm, Mary: Wife of Lincoln, p. 99-100. Paul Findley, A. Lincoln, The Crucible of Congress: The Years Which Forged His Greatness, p. 66. Douglas L. Wilson and Rodney O. Davis, editor, Herndon’s Informants: Letters, Interviews and Statements about Abraham Lincoln, p. 183 (Letter from Joseph Gillespie to William H. Herndon, January 31, 1866).